www.photomacrography.net :: View topic - Yellowjacket "portrait"
Posted: Fri Aug 18, 2006 7:04 pm Post subject: Yellowjacket "portrait"
From now into the fall, these yellowjackets will be regulars at my hummingbird feeders and outdoor barbeques! Awesome! Now I see why you named it a portrait. Thats a wonderful photo, Charles. What lens? Charles, that is such an incredable picture. "UNBELEAVABLE" They are getting ready for that last push before winter. Yep I would have to say that this is one really awesome portrait there Charlie. With the season geeting ready to change, these little devils are going to be a pain in more ways than one. You never know when or where you will have the misfortune of running into them. "Snick!" (That's the sound of the already high bar being raised yet another notch.) Very, very nice! I'm intrigued by the blue reflection on the right eye and antenna. I don't see how your standard backlighting would do that, so I'm wondering if you're trying out some new illumination scheme. Care to elaborate? PS. The graded background works really well here. Is it related somehow to the blue reflections? 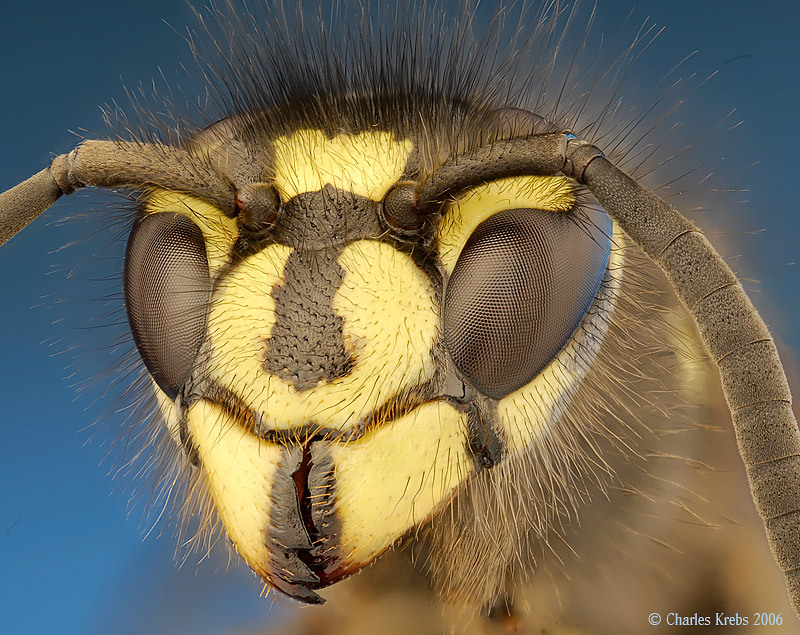 "I'm intrigued by the blue reflection on the right eye and antenna. I don't see how your standard backlighting would do that, so I'm wondering if you're trying out some new illumination scheme. Care to elaborate?" Isn't it just a reflection of the blue background in the eye? Could be Dave. Excellent possibilty, only Charlie knows for sure. I'm thinking of Charlie's setup as described at http://www.photomacrography1.net/forum/viewtopic.php?t=4869. In that setup, the background lighting is pretty directional. It seems like at least the lower section of the eye would be in shadow (from the standpoint of the background). And if it's just light reflecting from the fairly uniform background, then I'd expect to see it on the left eye too, and I don't. Nor have I seen such reflections in any of Charlie's earlier posts. Rik... I dusted off a table top camera set-up I made rather than use the microscope since the magnification was not too high. This also provides a lot more access and options for the background. This one happened to be quite serendipitous. I wanted to first finalize the primary subject lighting and then play around with the background. But while working on the main subject lighting I noticed that the room in the background (a very out of focus kitchen area) was bathed in skylight from a large window off to the right. Since the camera was set for "tungsten" for the main light, this background light was recorded blue, and had a nice variation in tone. The right eye and antenna showed a bit of reflection from this window light. I liked the effect so I just used it. Charlie, thanks for the additional info. I noticed the part about "Canon 35/2.8 photomacrography lens" in your initial posting, but somehow I never made the leap to realizing that this probably meant a tabletop setup. The lighting may have been serendipitous, but it was your artistic choice to keep it -- and a good one! "Ka-chink! Whiffle ball, eh? Got it!"